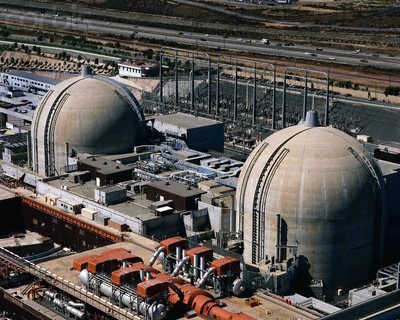 The San Onofre nuclear station is included in a list of commercial nuclear plants that have leaked radioactive tritium, a known cancer causing chemical. The US Nuclear Regulatory Commission (NRC) compiled the list. About one quarter of the nation’s operating nukes, 27 out of 104, have leaked tritium. Tritium is a radioactive form of hydrogen, created as a byproduct of nuclear fission. It combines easily with water, and can persist inside us for years if it enters our bodies. Recently a massive tritium leak at the Vermont Yankee nuke in New England has been in the news. The leak there has created a tritium contaminated lake in groundwater underneath the plant the size of a football field, and is moving towards the adjacent Connecticut River. Public outrage grew earlier this year as radiation levels in the contaminated water went sky high, and also because plant officials lied about them. At the end of February the Vermont Senate voted 26-4 to shut the plant down when its current operating license expires in 2012. The plant’s owner, Entergy, has been trying to get a 20 year license extension renewal from the NRC for the 38 year old Vermont Yankee nuke. Vermont is the only state where a nuclear plant license renewal must have legislative approval. In August 2006, during the demolition of Unit 1 at the San Onofre plant, “Radiation levels 16 times that allowed in drinking water were discovered…beneath the plant,” according to the August 17, 2006 Orange County Register. San Onofre Unit 1 is gone, but its spent fuel pool is still on its site, and is still full of lethal high level radioactive waste. These pools have a history of leaks too. The federal limit for tritium in drinking water is 20,000 picocuries pc/l) per liter. A picocurie is a trillionth of a curie. A curie is a measure of radioactivity in something or someone. The tritium found in San Onofre groundwater in 2006 in two samples measured 50,000 and 330,000 pc/l. Recent sample of tritium contaminated groundwater below the Vermont Yankee measured in the millions of pc/l. Almost all the 27 nuke plant leakers on the NRC’s list spewed their tritium in the 21st century. This is because they began operating in the 60s and 70s, and are now old and brittle. Yet the NRC has been handing out 20 year license renewals to all of them. San Onofre has yet to apply for 20 year license renewals for Units 2 and 3. “The root cause is the NRC. They’re in bed with the industry. The NRC is supposed to be the parent, but it’s not enforcing regulations. And the utilities are abusing their parents and society. So while the Obama administration is championing the construction of new nukes, the folly of nuclear power in aging first generation nuclear power plants continues to be the story of things falling apart. Thank you. I hope Jerry Brown wakes up in time to save us. At an increase in annual consumption rates of only 3% to 8%, uranium production falls incredibly short of the demand. As oil resources become scarce, uranium will have more pressure put upon it as a resource, so by 2020, there is a serious uranium shortage and these turkeys will all be out of business. Twenty year operating extensions ? Thorium reactors don’t require as much uranium, also they produce significantly less dangerous waste. There are certainly risks present with nuclear, but given the far greater risks associated with global climate change, they seem a better bet. Lets not forget the toxic (aside from the consequences of increasing atmospheric CO2 levels) output of coal (like breathing mercury dust?) and other fossil fuel energy sources. Solar and wind power, if used on a large scale, would also have major environmental costs that seem to be widely ignored. And fusion power (with the possible dark horse exception of Polywell fusors) is decades down the road, if it ever proves practical at all. Besides, here in OB, San Onofre is rather far away compared to the half-dozen or so hot reactors just over the hill at Naval Base Point Loma & North Island at any given time. That said, the US Navy’s nuclear safety record is second to none. Regardless, the need for electrical energy is not going away, but increasing constantly, and fossil-fuel based solutions are not going to cut it, for both supply and environmental reasons. Could you please provide the list (or a link) of the 27 nuclear plants which the NRC confirmed have leaked tritium. The NRC website itself does not provide a compiled list. I agree that Jerry Brown is awake. I live in San Clemente and am very concerned with physical problems my neighbors are experiencing, as am I. We believe there are minimal “nuclear” leaks, enough to make us feel lethargjc, with extreme stiffness of extremities over the past 3 months. This has all come on very, very sudden. This is extremely abnormal, does anyone living in San Clemete, have these same symptoms? Many of my friends and neighbors are experiencing these problems along with fatigue.